We all have good days and bads days; times when we are full of energy and times when we feel low. 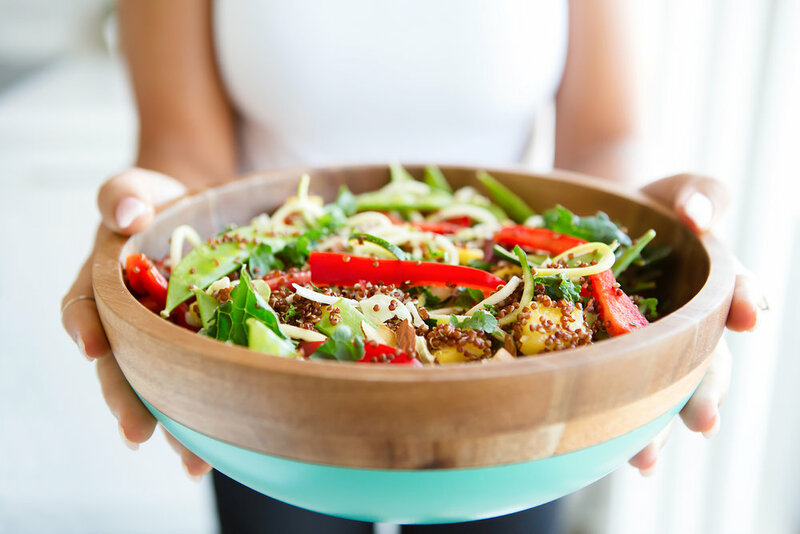 There are many factors that influence our energy levels and mood, such as the amount and quality of our sleep, our stress levels and hormonal shifts, but did you know that what you eat can also affect how you feel? The foods we eat, and how they interact with our body and mind is actually very complex. While we don't know the exact mechanisms of how food and nutrition impact on our overall health and well-being, we do know a few ways food impacts our mental health and energy levels. First, what we eat becomes the raw materials for our neurotransmitters. “Neurotransmitters” are biochemical messengers that allow our nerve cells to communicate (ever heard of serotonin?). They are important not just for our ability to think and our memory, but also for our overall mental health. Second, what we eat affects our blood sugar. And having unstable blood sugar levels can contribute to mood swings and changes to our overall energy. Think about how you feel when you haven’t eaten for a while and are really hungry (hangry!) or after you have eaten a big meal and seem to fall into a slump depending on what foods you ate. 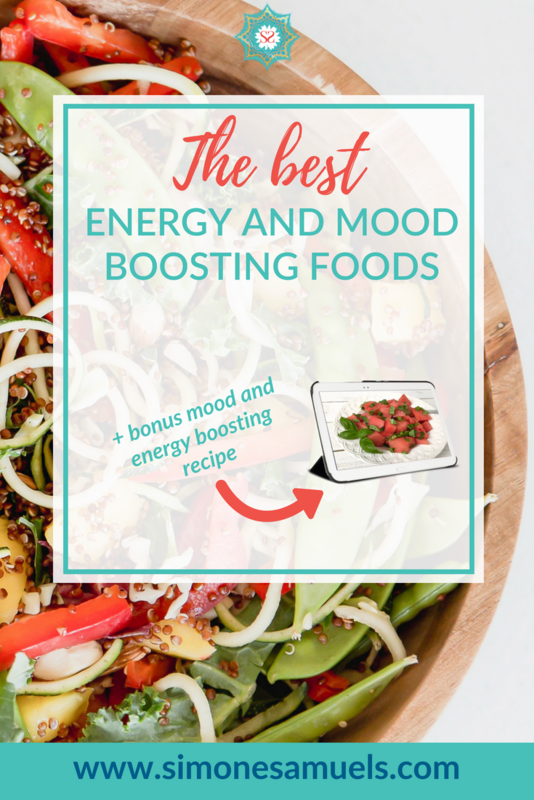 Let’s talk some more about mood-boosting and mood-busting foods. Some nutrient deficiencies look like mental health problems; this includes deficiencies in B-vitamins, vitamin D, and the mineral selenium. So, getting enough vitamins, minerals, (and other things like antioxidants) are key. These nutrients not only reduce inflammation but also fuel the biochemical reactions in our bodies. Including those that create neurotransmitters. So make sure you're eating a variety of nutrient-dense whole foods, especially fresh fruits and vegetables. In fact, studies show that people who eat the most fruits and vegetables are the happiest and the most energised. Second, make sure you get enough protein. Protein is your body's main supply of amino acids. Amino acids are very important for mood and energy issues because they are the building blocks of neurotransmitters. Protein also helps to regulate blood sugar. I recommend eating protein with every meal; this includes dark green leafy vegetables, beans and legumes, tofu, tempeh and eggs. Third, complex carbohydrates like sweet potato and quinoa are great too. They allow better absorption of key amino acids like tryptophan. Tryptophan is used by your body to make serotonin (your “happy hormone”) and melatonin (your “sleepy” hormone). So, if you want to relax, try eating these in the evening. Fourth, sources of omega-3 fatty acids (nuts, seeds, and algae) are also mood-boosting foods. Omega-3s are definitely “brain food” and may help to ease some symptoms. FUN FACT: One study showed that giving one multi-vitamin and one omega-3 tablet per day to prison inmates reduced the incidence of violent behavior by 50%! Last but not least, make sure you’re hydrated. Mild dehydration can cause mood and energy issues as well. 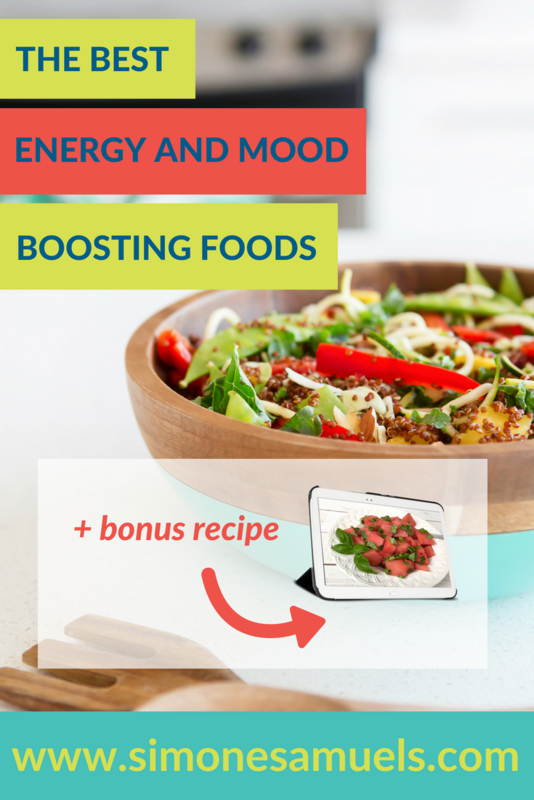 You won’t be surprised to hear me say processed foods are mood and energy busters, right? One study suggests that eating a lot of processed foods devoid of nutrients can increase your chances of becoming depressed by as much as 60 percent! This is on top of the research that shows nutrient deficiencies can look like mental health problems and fatigue. “But it makes me feel good!” I hear you saying. Yes, some of these mood busters can make you feel better temporarily. Some big food companies study how to maximize the "pleasure" centers with the perfect amount of sugar, salt, and fat. Not to mention the color, texture, and taste; they can light up our taste buds and make us feel good… for now. However, long term these foods eaten regularly can affect our brain and body detrimentally. Bad moods and sleepiness can lead to bad eating habits; and, bad eating habits can lead to bad moods and even less energy. 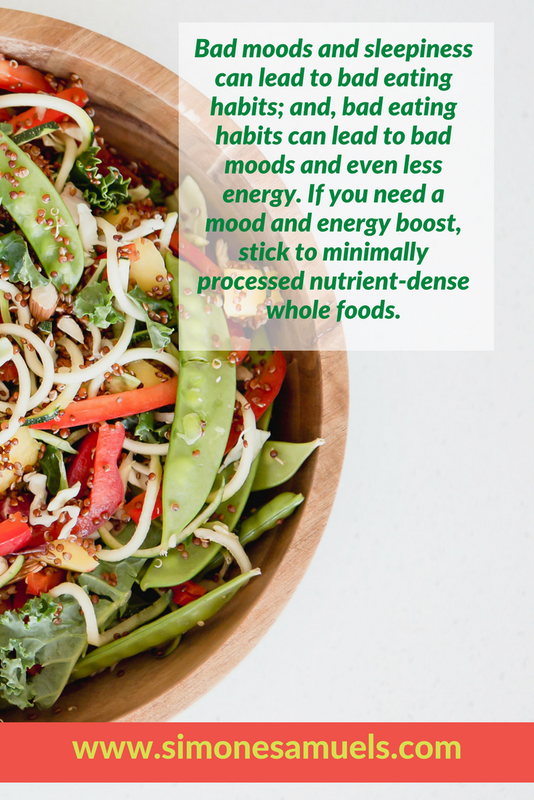 If you need a mood and energy boost, stick to minimally processed nutrient-dense whole foods. Things like fresh fruit and vegetables (including leafy greens), nuts and seeds, and eggs. Avoid common mood-busting foods like alcohol, caffeine, and sugar. There are some other ways that food and mood are connected which I talk about in this blog post. And remember, sometimes “feel good” junk foods, only make you feel good temporarily. 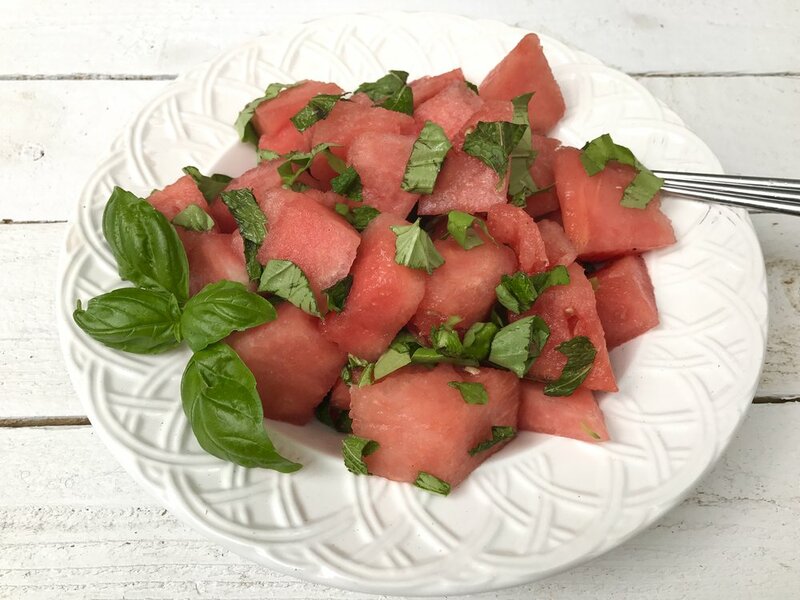 So, try my newest recipe below for a feel-good, energy boosting snack. There is no need to let low energy and a bad mood stop you from moving forward in your biz and doing what you need to do in your family and social life. I’d love to know what resonates with you from this post. Share with us in the comments below! If you would like my support in changing some of your lifestyle habits so you can be healthy and wealthy, I still have two spaces left this month for my Healthy You, Wealthy Business 90-minute coaching package which I have created with you in mind.